Steven Gerrard compares Everton to Stoke? Liverpool captain Steven Gerrard has stirred up a little extra controversy after the weekends Merseyside derby at Goodison Park. The game was full of major incidents, as is usual for the clash between these two sides. Luis Suarez was wrongly denied a last minute winner for Liverpool as the assistant referee judged the Uraguyan striker as being offside from Sebastian Coates’ header. However, Suarez could arguably have been sent off for a tackle on Kevin Mirallas which forced the Everton forward off with an injury. Once again the Liverpool front man was involved in the controversy as he performed a Klinsmann-esque dive to celebrate his second goal in front of David Moyes on the touchline. 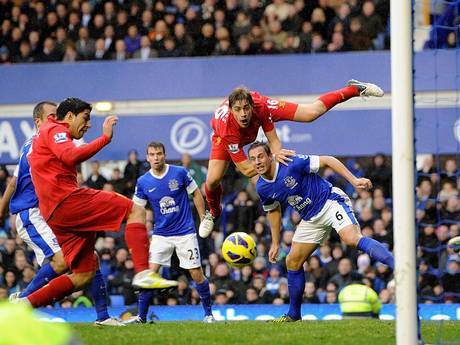 Phil Neville added to the nature of the game after he was booked for a dive on the edge of the Liverpool box. The Everton captain later apologised for his theatrics but his opposite number Gerrard, has added fuel to the smouldering fire in the aftermath of the game. I usually find Gerrard to be spot on with his comments and opinions after a game but I have to strongly disagree in this case. There is no way that Liverpool were the only team who came to play football and I think the stats from the game completely contradict Gerrard’s claim in this instance. Everton dominated the second half of the game enjoyed the majority of the possession with 55% of the ball over 90 minutes. The Toffee’s also completed more passes than Liverpool and their proportion of long passes was around 1% lower than Liverpools’ (13.8% to 14.6%.) Looking at Everton’s performances this season there is no way they should be labelled as a ‘long ball’ side. Moyes’ team have played some good, flowing football this season and scored plenty of goals putting three past Aston Villa, Swansea and Southampton as well as beating Manchester United 1-0. The Toffees completely outplayed Swansea in their Premier League encounter a few weeks back, the Welsh side have been credited as playing some of the most attractive football in the league last season and the start of this campaign. Gerrard also refers to Everton as having “…some big, physical lads…” Marouane Fellaini is obviously a big and physical threat but if you look at the starting line up, four out of the six midfielders and forwards for the Toffee’s are below 5’11. Phil Neville, Steven Naismith and Kevin Mirallas are all 5’11 or smaller and two of the smallest players on the pitch in Leon Osman and Leighton Baines started the game for the Blue’s. Osman in fact scored Everton’s first goal of the game. 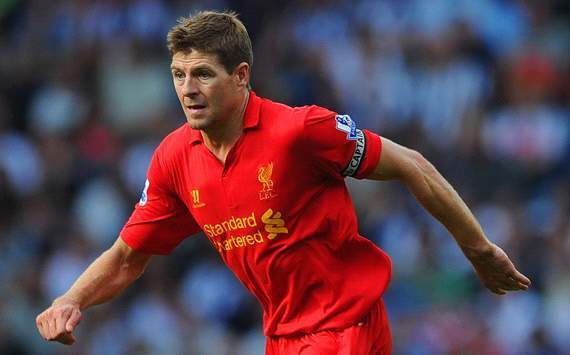 Gerrard also said, “I thought we stood up to a team that are very similar to Stoke. Every single time they got the ball to their goalkeeper it came in long.” What ever happened to the days when Liverpool would dominate the derby games and dictate the play to beat their rivals. The fact that Gerrard says they had to “stand up” to a strong Everton team shows just how far the Toffees hae come under David Moyes and how far Liverpool have declined in recent years. I think Steven Gerrard has come out with some very unjust comments on this occasion. It may be just a heat of the moment outburst as Liverpool were denied a clear winning goal but I honestly feel that the comments were completely out of order on the part of the Liverpool captain. The fact that Liverpool are currently sitting 12th in the Premier League and Everton are 5th speaks volumes for me. For all nice football that the Anfield club have played on occasions this season, football is a results business and Moyes has had both the results and the style of football going for him this campaign. Overall, I think Gerrard should have put a lot more thought into this before making such comments, especially as the statstics from the game speak louder than anything. They are usually not that good either XD.